This large (65sqm) apartment is located on the ground floor. It consists of a living room with 2 single sofa beds, dining area, kitchenette, a double bedroom, a twin bedroom and a bathroom with bath (shower head). Overlooking front yard and pool, nice big covered porch. The holiday complex is located 2 km from the beautiful medieval village of Torrita di Siena, in the heart of the Val di Chiana. We returned for a 5th stay at this apartment to a very warm welcome from Marina and the family. The location is very peaceful, yet the major attractions of the Val d'Orcia and Val di Chiana are a short drive away. This area is a photographer's paradise, and the freedom of self catering permits early starts or late finishes, without worrying about getting back in time to catch set meal times. Torrita di Siena is within a few minutes drive and offers a good supermarket and other shops, plus a weekly market, and railway station allowing access to the whole of Italy via connecting stations, although a car makes life much easier. We hope to return again next year, and for several more after that!! This is our fourth stay at this family-run property over the past few years. The apartment is always clean and tidy, with new mattresses bought for the beds recently. The family are very friendly, and ready to welcome guests. The location is tranquil, being set in the countryside, just a kilometre away from the centre of Torrita di Siena. 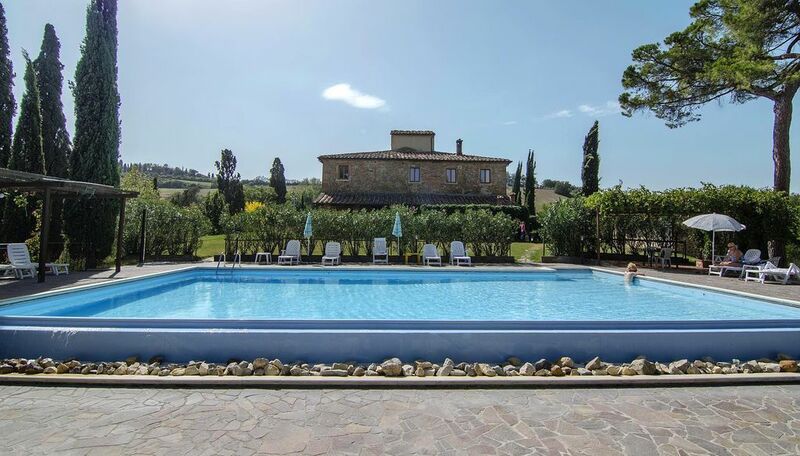 The property is within 30 minutes of the towns of Montepulciano, Pienza and Cortona as well as the stunning countryside of the Val di Chiana and Val d'Orcia. Siena is just over an hour away by car, so this apartment is very close and accessible to the main attractions of this region. We look forward to a swift return. Geweldige locatie in het mooie Toscaanse land. Ideaal om de omgeving te verkennen of te ontspannen bij het zwembad. Wir haben eine wunderbare Woche in der Wohnung Gelsomino verbracht. Große Zimmer, große Küche, super Terrasse, große Pool! Die Besitzer sind total nett und hilfsbereit. Härligt lantligt men ändå nära till allting. Hit vill vi åka igen. Mkt trevliga och hjälpssamma värdar på plats!